Inspired by The Basketball Diaries, My Father’s House is an homage to the sparse lyricism of Bruce Springsteen and the slamming, punchy storytelling of The Ramones. 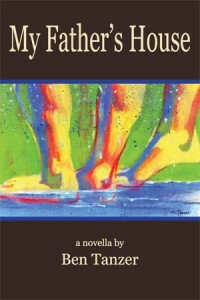 Both raw and humorous, it is a tale of illness and coping, fathers and sons, and the birth of the writer. It explores compulsions and confusion, and how it is we deal with grief, ghosts and our inability to communicate what we feel and think and need despite our every desire to do so. With nods to JFK Jr., Ray Bradbury, Magnolia and all things in between, My Father’s House is a journey that begins by asking whether we can ever know death, and along the way shows us that if even if we cannot, it doesn’t mean we shouldn’t face it, embrace it, run with it and ultimately let it wash over us like a song. Ben Tanzer is the author of the books Lucky Man, Most Likely You Go Your Way and I’ll Go Mine, Repetition Patterns, 99 Problems and the forthcoming novel You Can Make Him Like You. He also oversees day-to-day operations of This Zine Will Change Your Life and blogs at This Blog Will Change Your Life the centerpiece of his vast, albeit faux media empire. He is currently watching Sports Center, but upon his deathbed, he will receive total consciousness, so, he has that going for him, which is nice. Tanzer is a goliard for our times, singing, laughing, and wise with our sorrows. The prose of Ben Tanzer’s My Father’s House is a waterfall, crashing cool onto our fevered heads and then carving pathways straight through to our hearts, never slowing, never shying, laced with the glitter of honesty, fear, and a son’s love for his dying father. Despite the torrent, Tanzer shows exemplary control as he brings us into his narrator’s swirling mind to explore the black, bottomless pools of all things yet to be experienced, and he does so with humor and wit, often employing buoyant insights that crack the water’s surface like summertime toes pointing to the mist as it rises through the trees, skyward. Ben Tanzer writes with such empathy, vulnerability, and humanity that it hurts. My side hurt from laughing when I read his charming and insightful sophomore novel, Most Likely You Go Your Way and I’ll Go Mine. Now my face hurts from fighting back tears after reading My Father’s House. This novel is instructive and inspiring. First, it teaches you what it is like to face the pain and challenges of losing a parent to an awful disease. Then, it shows you an example of a graceful, beautiful, and redemptive recovery in the face of that loss. Tanzer writes movingly, insightfully, and bracingly. Few things remind us we’re utterly alone in this universe like our dads dying. At the same time, few things can remind us we’re all in this together like great literature. In My Father’s House, Tanzer took the first and made the latter. It’s a sincere and important book full of grace, beauty, and… I’m happy to report…a delicious humor. I can’t recommend it highly enough. I don’t even remember how this started exactly. I know it was 1999 and I know that my father had a seizure. I know his blood didn’t look right. And that there was something going on with his bone marrow that looked to be pre-cancerous, but needed to be confirmed with a genetic test. The doctor at Sloan-Kettering says that my dad may have been sick for awhile because his red blood cells looked low as early as last summer. The doctor also said that my dad needs a bone marrow transplant and that the disease is worse then they thought and progressing, though it’s just hard to imagine how that’s possible. The thing is there needs to be a match, and while siblings are the best bet, it turns out that they only match about twenty-five percent of the time. In comparison, children only match about three percent of the time, however, so they won’t even test my brother Jerry and I until they are truly desperate. So, maybe my uncles will be a match. Or maybe it will be Jerry or I. And if it is one of us then maybe they will wheel us into some cold and antiseptic hospital room and put tubes into our lower back and then very slowly draw the bone marrow that could very well save my dad’s life. Sure it would, though this is assuming of course that he doesn’t die on the operating table, that his body doesn’t then reject the transplant or that some opportunistic infection doesn’t wreak havoc on his now compromised immune system. But let’s say that there is a match, and that these things don’t happen, who knows what’s possible, right? I can feel a little hopeful, can’t I? Well, I don’t actually know that anyone would quite say that, because I don’t know that anyone really knows anything, most of all me. It’s the image I won’t let go of. It’s a keeper. I call Jerry to talk about our dad and we will talk about him, we just won’t talk much about what’s going on. Jerry doesn’t do that. People joke about how siblings always seem to have somehow grown-up in different homes and yet somehow that usually seems to be the case. Families do change over time. Parents change. Circumstances change. Sometimes its financial, or the outcome of more, sometimes less members. The dynamics are always swirling. My dad never worried about Jerry. From the start Jerry seemed to know what he was doing and he was treated as such. He could come and go as he pleased and so for him the house was a way station between things and the world he lived in was far removed from the anxieties and tensions that intermittently sprang to life wrapping my mother and I in tendrils that still linger even if they’re more like ghosts now, hovering and watching, if not totally apparent to the naked eye. There is one association with growing-up that we hold in common though, and it is always something we can focus on when other topics are too difficult to tackle. Our dad was from New York and he thought of himself as a tough guy. “Right, continue” Jerry says even though he has heard and told this story a thousand times. “It’s funny isn’t it,” I say. “I don’t see what you mean,” Jerry says. Jerry doesn’t really remember the bad stuff, or let himself get angry. I envy that. “And you know that just might be true,” I say. “Yeah, maybe, I hope so,” Jerry replies. And then we get off of the phone. If you’d like to read the rest of the story, order My Father’s House by Ben Tanzer today. Be the first to review “My Father’s House” Click here to cancel reply.